Mazie is ready to celebrate liberty. She is ready to celebrate freedom. She is ready to celebrate a great day in American history -- the day her ancestors were no longer slaves. 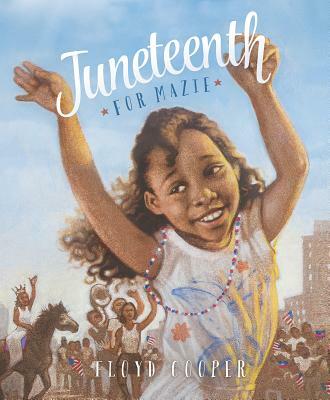 Mazie remembers the struggles and the triumph, as she gets ready to celebrate Juneteenth. This beautiful story by award-winning author and illustrator Floyd Cooper will captivate both children and adults. Award-winning author/illustrator Floyd Cooper received a Coretta Scott King Award for his illustrations in The Blacker the Berry and a Coretta Scott King Honor for his illustrations in Brown Honey in Broomwheat Tea and I Have Heard of a Land. He lives in Easton, Pennsylvania, with his wife and children.Award-winning author/illustrator Floyd Cooper received a Coretta Scott King Award for his illustrations in The Blacker the Berry and a Coretta Scott King Honor for his illustrations in Brown Honey in Broomwheat Tea and I Have Heard of a Land. He lives in Easton, Pennsylvania, with his wife and children.